If you have been wanting to experience a PokerDivas event, we welcome you to come and learn the game for a great cause while networking with a great group of professionals. 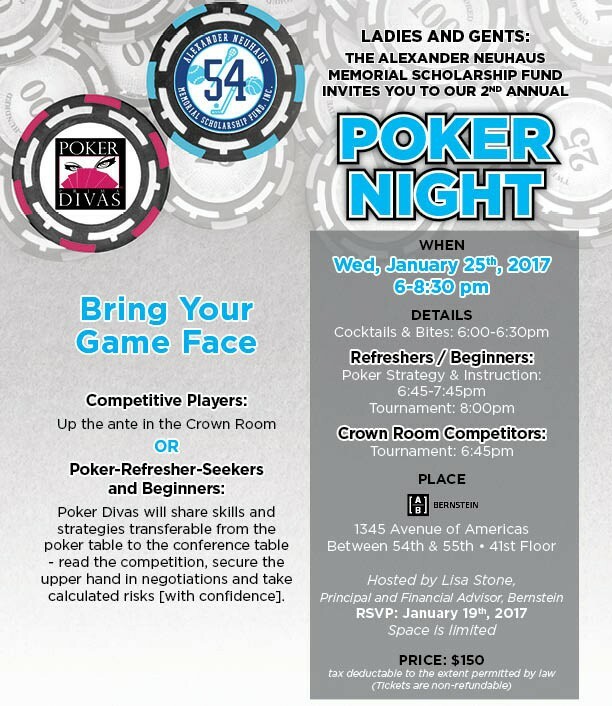 Join us for a night of instruction and play to benefit the Alexander Neuhaus Memorial Scholarship Fund which awards sports scholarships to under-served young athletes so they can learn the lessons of team sports. Please feel free to forward to the women in your company or clients that you think would enjoy and benefit from the program. I hope to see you there! Details below. The mission of the Alexander Neuhaus Memorial Scholarship Fund, Inc. is to award athletic scholarships to youth who demonstrate tolerance, empathy and sportsmanship to all team players – on and off the field. The Alexander Neuhaus Memorial Scholarship Fund, Inc. is a not-for-profit charity recognized by the IRS under 501(c)(3). Contact us or book your event today and we will send you a complimentary copy of Poker Woman: How to Win in Love, Life and Business Using the Principles of Poker. Know a friend or business colleague who could benefit from some serious negotiating skills? Take advantage of our Referral Program. Contact us at 646-450-1905 or via email to book your event! Wondering what we’re all about? Watch the quick video to learn more about us.